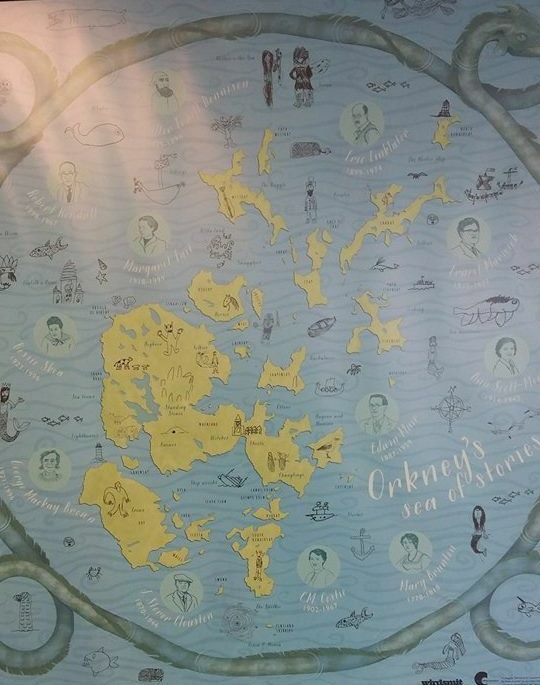 Last Thursday we were gifted this lovely Orkney Writers/Story tellers map which is now hanging in the Junior section of the library. It was part of a project funded by the Clore Duffield Foundation to introduce young folk in Orkney to Orkney writers of the past. 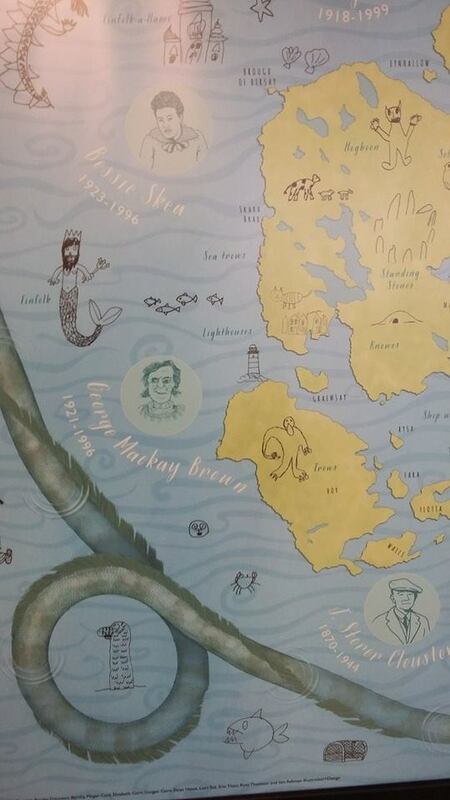 The map was gifted to the library by Wirdsmit and the George Mackay Brown Fellowship and contains lots of lovely illustrations done by the young people, interspersed with pictures of the Orkney writers. Do come and have a closer look, it's a great addition to the new library. Well here we are in our new home! 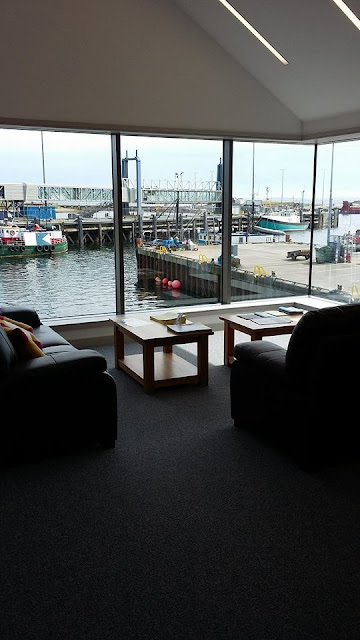 A warm welcome to all our readers, new and old, as we start the next chapter of the Stromness Library story in our lovely new home at the Warehouse Buildings in Victoria Street. 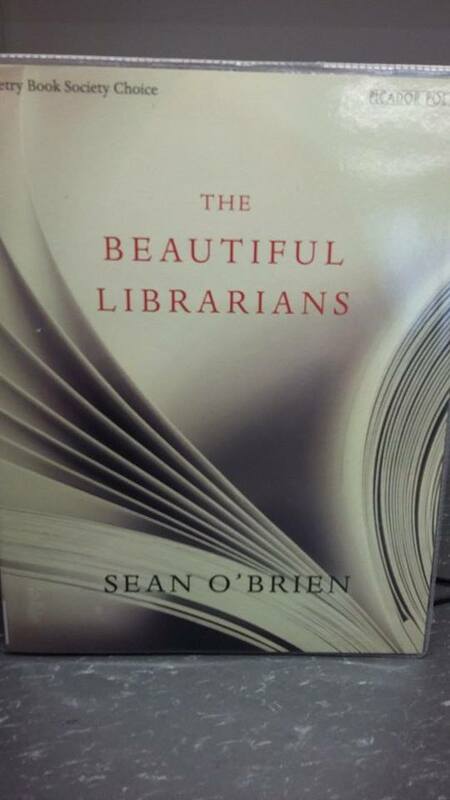 As with all moves there has been a period of transition as we get used to the new building, and our new roles as library assistants/customer service assistants. With the expanded range of services on offer there are now two of us working at the reception desk. This means the team has grown, with Carol and Becky being joined by Soo and Sarah, along with our relief staff Keely, Angela, Lara and Evelyn. We've been enjoying welcoming old and new faces to our fantastic new facilities and services, which include three public meeting rooms, a range of council customer services, comfortable reading and study spaces, and even a coffee machine! As the weeks go by we'll introduce you to the team on the blog and learn a bit more about life in the Warehouse Buildings. In the meantime you can read more about the history of the library, and both old and new buildings on the New Chapter website,which was developed for the library by Rebecca Marr, and features an original audio piece First Lines, produced for the project by Mark Jenkins. 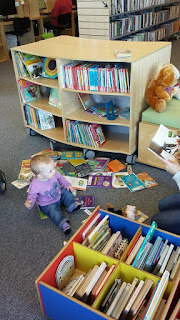 We are always delighted to welcome visitors to the Stromness Library, and even more delighted when they come back for a return visit. In the last couple of weeks we've had visits from two former writers in residence at Stromness Library, Jan Natanson, and Nalini Paul , as well as our Ravelry friend Westendangela. While Jan and Nalini shared news of recent writing projects - Jan has a community play in production, and Nalini has a poetry book coming out soon - when knitters get together the talk soon turns to work in progress and recent projects on the knitting needles. We were rather pleased to be able to show off our library cushions, and Becky even posed for a photo beside the windows which were the inspiration for the design. Watch this space for news about the date of our move to the new building, but in the meantime here is a sneaky preview of the cushions in their new home. Now doesn't that look comfy? Just perfect for relaxing with a good book, or even a bit of knitting! 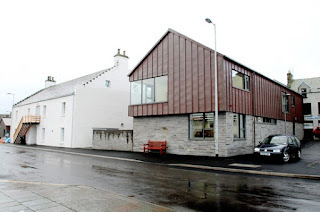 As we continue our preparations for the move to our lovely new building, we've been reflecting on our favourite memories of Stromness Library, and we would love to hear yours. Perhaps you remember coming to the library as a child and have memories of previous librarians, or you visited us while you were in Stromness on holiday. We would love to hear your stories, memories, favourite books and encounters with the library cats. 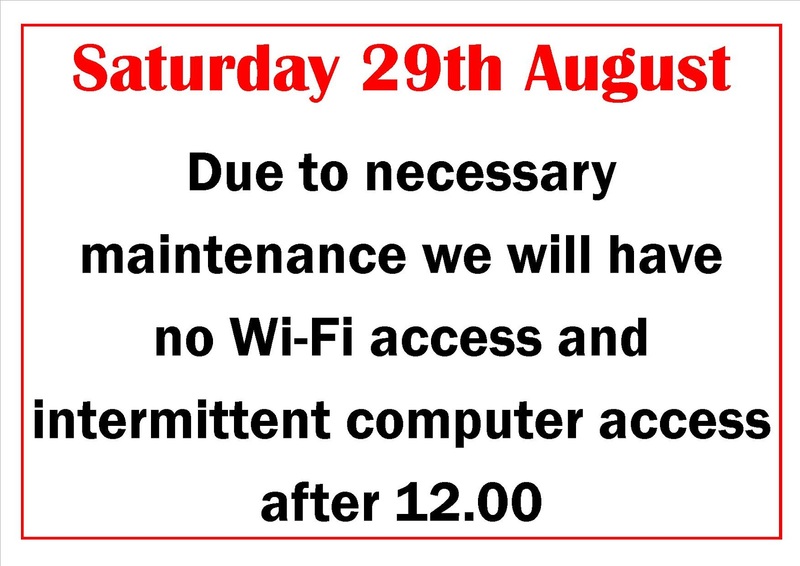 Do please get in touch, either through the comments below or by dropping us an email. We are gathering all these stories from and about the library for our New Chapter exhibition which will celebrate the history of the library in Stromness when we move to the new building. We want to capture as many stories as we can from the most important part of any library - you, the people who visit it. Over the years we have worked here there have been many memorable moments, some funny, some sad, and some unrepeatable! Today we were recalling the many items we have found inside returned books. 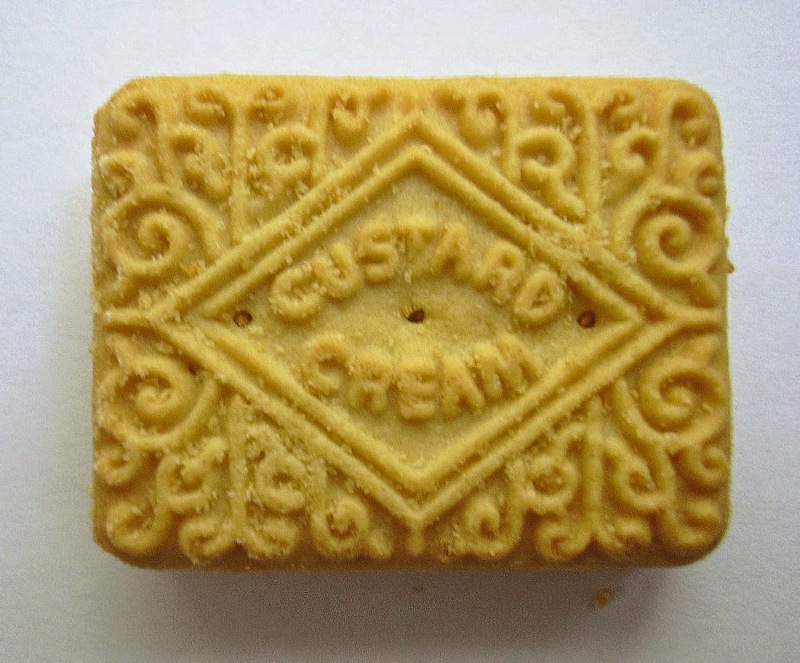 Along with the more predictable discoveries of bookmarks, letters, bills and the like, we can reveal that we once opened a book to discover a custard cream biscuit between the pages. Whether this had been inserted as makeshift book mark, or left behind by accident during a particularly exciting reading-while-biscuit-eating-session, we will never know. When we mentioned our find to a colleague in Kirkwall library, he claimed to have once come across a rasher of streaky bacon being used as a book mark. While we were unable to verify this claim, we would strongly discourage our readers from reading while eating a fried breakfast - just in case. If you are in need of a bookmark we have lots here to choose from, including our very own Orkney library bookmarks - save the custard creams to go with your cup of tea! Don't forget to put your clocks forward tonight as we 'spring forward' to lighter evenings and the promise of warmer days to come. 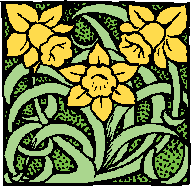 Soon Spring will come, and then the thrifty crofter Must yoke an ox, and drive his eager plough Through the wet mould. the sower will follow after, And cast the good seed, rhythmical and slow, Along the furrows fringed with April snow. After a generally rather mild winter, will April be the month that brings us snow? 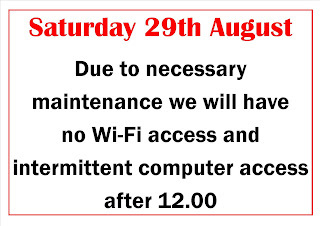 If you're wondering what to do on a miserable Saturday afternoon why not pop in to the library for a bit of inspiration? 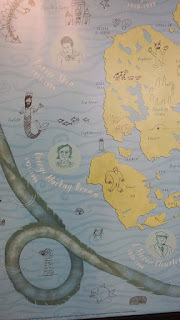 Stromness is of course a community full of creativity, and as regular readers will know there are often exhibitions of the many talented artists in the town. But for those of us for whom a paintbrush is more of a DIY tool than a means of self expression, the recent BBC television series The Big Painting Challenge may have sparked an interest in exploring our own inner artist. If you're looking for a bit of guidance then we can help, we may not be able to offer artistic advice but we can certainly find you a book that can. With titles from 'Everything You Ever Wanted to Know About Oil Painting' to 'Reader's Digest Guide to Drawing and Painting' there should be something to help you choose the right materials and tackle your first masterpiece. 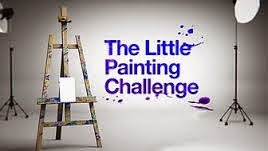 While you're in the library you can also pick up an entry form for The Little Painting Challenge. Create a drawing or painting on the blank side of the postcard and then send in your entry for the chance to win a prize and perhaps even see your work exhibited in the newly refurbished Whitworth Art Gallery in Manchester from the 4th of May 2015. Entries close on April 2nd so you still have plenty of time to find your muse and get creating. 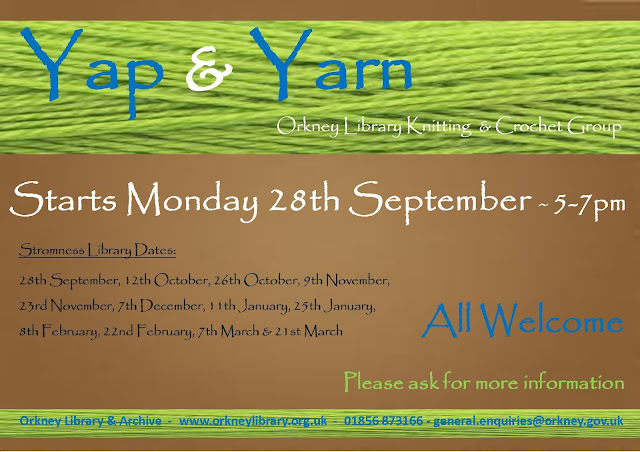 We thought you might like to see what the Yap and Yarn group have been working on in preparation for our move to the new Library. 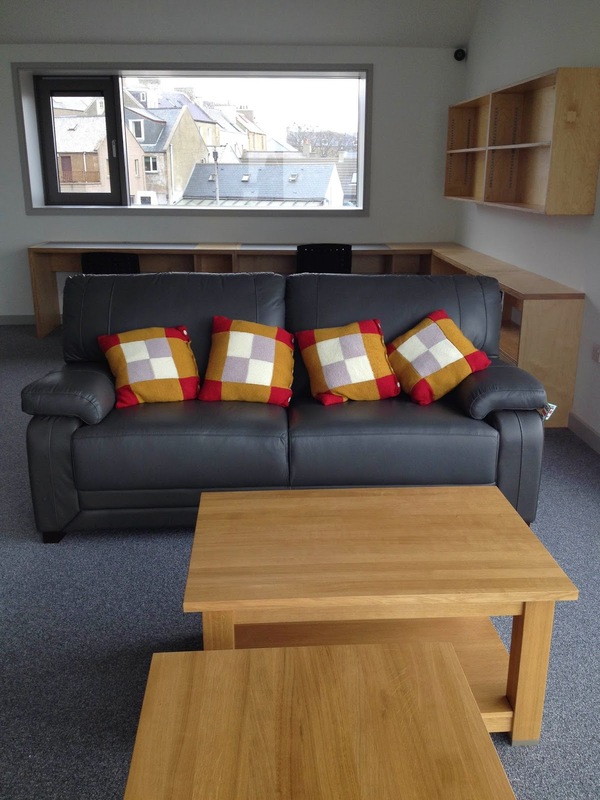 We decided it would be nice to find a way to make something for the new building which reminded us of the old library, and came up with the idea of cushions for our lovely new comfy sofas. As you can see, the design is based on the coloured glass windows in the old library. We decided to make 6 cushions and here we are working on the final one! We were overwhelmed by the entries to our competitions to design a bookmark for the new Stromness Library and a new children's library bag. The quality of the entries gave our judges a very difficult decision to make but we are delighted to be able to announce the winners. 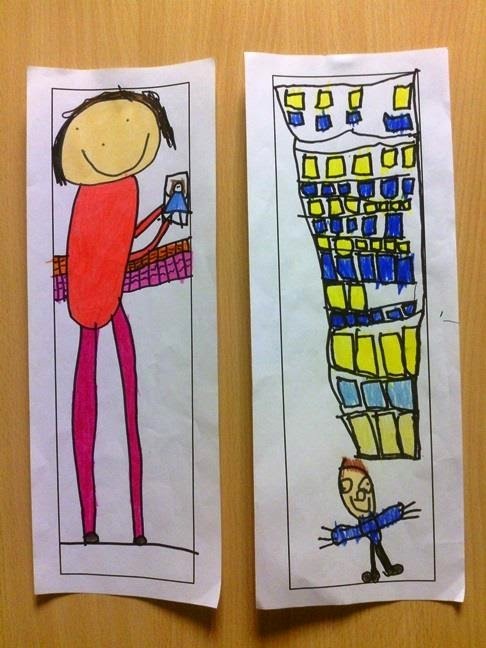 Congratulations to Erin Rose Bayliss and Magnus Groundwater, joint winners of the bookmark competition. 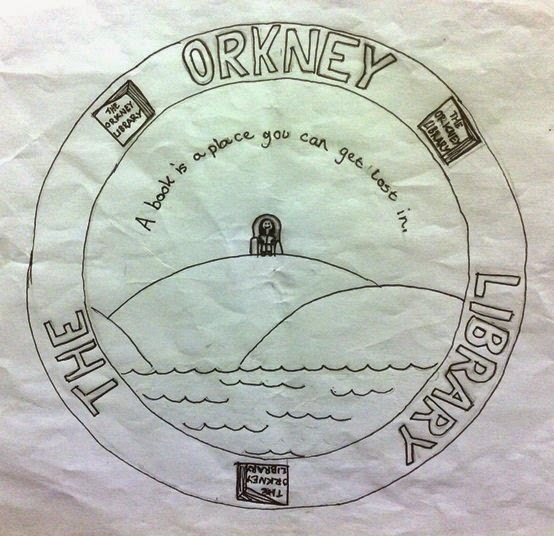 Congratulations also to Lucy Barton whose winning entry will be the new design on our children's library bags. Thank you to everyone who entered. We can't wait to see the winning designs as bookmarks and bags. We don't know about you but by this point in January we are in need of a bit of a boost. The festive cheer is but a distant memory, as are our resolutions to stay out of the biscuit tin and start a detox/exercise plan/decluttering regime/self improvement scheme etc. So having a legitimate excuse to eat haggis and clapshot, munch shortbread, and drink whiskey is just what is needed to lift the spirits - if also accompanied by the reading of Robert Burn's poetry, some good fiddle tunes and perhaps even dancing we might even forget the howling wind and freezing rain outside! Advent Quiz - the result! We hope you enjoyed our Advent Quiz for 2014 - the answers have now been published on each day's post. Congratulations to our winner Carola Huttmann. 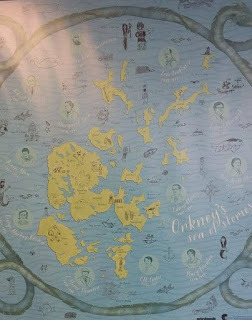 Carola, if you could email us at stromness.library@orkney.gov.uk we will arrange to get your fabulous prize to you.